Happy Monday morning to all of you! Seems like the weekends go so fast. But then again that’s an observence that’s been made since we started marking calendars. Thanks to all of you who responded to this weekends poll. Per usual, we got some illuminating replies. Let’s dive into the results. The first question asked was “What is your favorite success story from MNPS this year?” “Project Lit” won by a very narrow margin over “Teachers collecting enough signatures to begin collaborative conferencing.” Both are great success stories. The collaborative conferencing win is a tricky one though, as it can turn on a dime into a negative story. Everybody needs to realize that at the root of CC, it is a union busting tool. I know some would take exception to that, but that’s the truth of it. The process is long and arduous, providing hope for a limted number of potential benefits and ample opportunity for teachers to become frustrated with the union. Hat’s off to all those that are working so hard to fight against those odds and attempting to wrestle a positive outcome out of a purposely difficult process. Tusculum Elementary will be complete in 2017!!! Glendale Spanish Immersion Elementary awarded National Blue ribbon school! On the question of “what makes your school truly special”, the number one answer was “teachers” at 43%. “Culture” was the number 2 answer at 36%. Coincidently, this week is “Show Your Love For Teachers Kick Off Week”. I always have a little bit of an issue with this week. You can’t expect to disrespect teachers all year and then expect one week to make it all good. But I will bury my inner crumudgian, because teachers deserve all the accolades people are willing to offer. That said, NPEF has compiled an impressive list of participating merchents offering discounts to teachers to show their love. Unfortunately all the answers weren’t positive. Some of these answers highlight the pressing need to work even harder on our schools. Positive can come from negetive if we acknowledge that there is work needs to be done. Lastly, I wanted to know who your go to education writer was. Results here surprised me, though on reflection, they shouldn’t have. The overwelming favorate was Chalkbeat TN’s Grace Tatter. It seems that in just a few years Ms. Tatter has really earned your love as she managed to get twice as many votes as the runner up, national education icon Diane Ravitch. I must say that I’m kinda happy that Zack Barnes finished third. I am not particularily a fan of Mr. Barnes’s, but the fact that people who are read me as well, makes me happy. We seem to get more and isolated as a society and it seems like at times that we are just writing missives to reaffirm each others foregone collusions instead of actually attempting to spark a deeper conversation. Searching for that deeper conversation is always the motive here at Dad Gone Wild, but particularily so behind my latest piece. The fact that DGW is cultivating an audience that is looking for a 360 view thrills me. As for write in votes, board member Amy Frogge and Tennesean columist Jason Gonzales both picked up a couple. As well as a writer who I was not familiar with, but after researching believe we all should read, Nikole Hannah-jones. 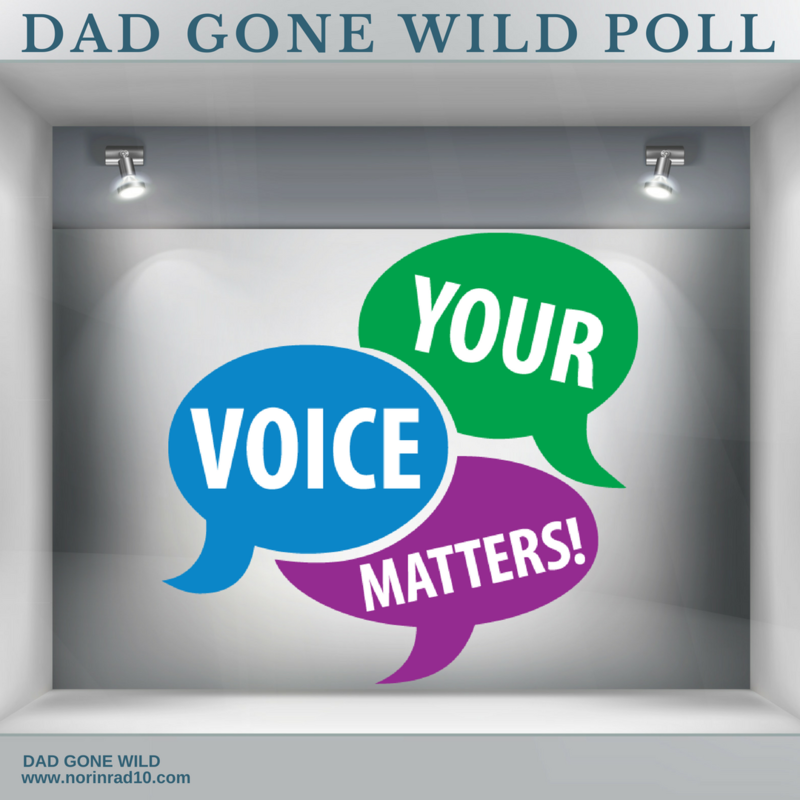 Thank you to all who showed love to Dad Gone Wild. Your kindness is much appreciated. That’s it for now. Testing is done and now it’s time for field days to start getting scheduled. Teacher’s let me add my voice to the chorus that says thank you. Look for a post soon on my testing experiences this year and one on my experience as a head coach for a 4-6 year old little league baseball team. Friday we will have some more questions. Till then…peace out. This blog reads as though school is over for the year. We still have 3 weeks of instruction and then a week (albeit half-days) of exams. There is still time for a survey or two. How about a “final exam” survey?